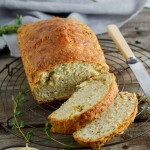 This cheese and herb beer bread is an easy recipe that is crazy good served with a steaming pot of chili or simply enjoyed with butter. Pre-heat the oven to 170°c and grease a loaf tin well. Add 1 cup of the cheese and herbs and mix well then pour in the beer and mix until just combined. Transfer the dough to the prepared loaf tin then scatter over the remaining cheese and place in the oven. Bake for 45-60 minutes until the bread sounds hollow when tapped. Remove from the oven and allow to cool for 20-30 minutes before serving.